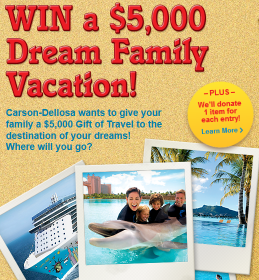 Carson-Dellosa “Summer Dream Vacation Giveaway” Sweepstakes – Win a travel voucher worth $5,000! Win a travel voucher worth $5,000! ENTER SWEEPSTAKES HERE – Carson-Dellosa Sweepstakes page. ELIGIBILITY – The Sweepstakes is open only to individuals age 18 years or older [age 19 in AL & NE] located in any State of the United States and in the District Of Columbia (“D.C.”), except that it is void in Rhode Island. SWEEPSTAKES PERIOD – Sweepstakes begins on or about 12:00:01 AM CT on April 1, 2014 and ends at 11:59:59 PM CT on June 10, 2014. PRIZES – One (1) Grand Prize will be awarded to verified prize winner. The grand prize is a travel voucher with Corporate Vacations (partner of American Express Travel) worth $5,000.00, USD. The travel voucher can be redeemed for $5,000.00, USD, worth of travel expenses when vacation is booked through Corporate Vacations.